For the past 21 years Bill has worked with L&A as a construction consultant. From the east coast to the west coast and all locations around the nation, you will find awesome playgrounds that Bill supervised. From small tot playgrounds to large all-inclusive play spaces – Bill’s been a part of them all! His experience spans from the community build model to contractor installs. Bill’s experience is extensive and solid. Among his many great qualities, his outgoing personality and excellent people skills are one of the biggest assets he brings to L&A and the communities he works with. 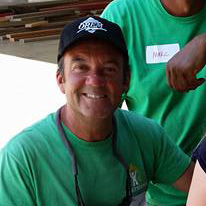 In the field, Bill draws on his wealth of building experience and expertise to help bring great playground designs to fruition. His creativity is evident when working with the design and special features committees in creating unique playground details and artwork. Bill has a can-do, positive attitude and excellent on-site teaching ability. Bill is a nationally certified playground safety inspector (CPSI) and knows the safety standards and guidelines that apply to today’s playgrounds. He has personally supervised hundreds of successful playground builds. In addition to his experience throughout the US, Bill has also led projects internationally in England and Australia.